On paper URB-E's range is 20 miles on one charge, an industry best in its own right. In reality it is a magnitude more than that. In Southern California URB-E can now take you over 534 miles, with a helping hand from our new partners at Metrolink. By conquering the first and last mile, the distance to and from trains, buses and ride sharing services, URB-E can help take you wherever you need to go faster than anything else, no matter how far. And now, in partnership with Metrolink, every new URB-E comes with a redeemable promo code for a 7 day free pass on Metrolink in Los Angeles! Purchase any URB-E model between January 1, 2017, and May 31, 2017, and receive a coupon code for a FREE 7-day Metrolink pass direct from URB-E. Just email Brandt at brandt@urban626.com with your order number, and we'll send you your pass! 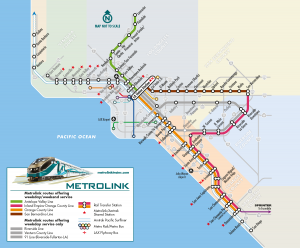 With 59 individual stations and 7 different lines spanning from Ventura County all the way to San Diego, Metrolink is the premier Southern California commuter rail. Starting at only 30lbs, the $899 URB-E Sport is the perfect electric vehicle for getting you to and from any Metrolink stop. With users saving on average over 4 days of time and thousands of dollars per year, URB-E will revolutionize your commute and the way you live your life. URB-E is officially approved for use on the Metrolink thanks to its high quality American construction. URB-E is the ultimate solution for transportation throughout the Los Angeles region. A car-less lifestyle in Los Angeles even 5 years ago would've been the stuff of dreams, but now thanks to URB-E and Metrolink, it has become reality. See how an entirely new way to live can be yours for as little $49 a month.